Our Team Approach keeps your project on schedule and on budget. To consistently provide exceptional service we bring together a reliable, proficient team of professionals. Our in-house design and drafting team helps us develop strategies to meet you specific goals and objectives. We have four in-house crews of dedicated specialists, who have extensive construction backgrounds to comprehend all phases of operations. A State-Of-The-Art Computer System called PAYDIRT ® gives our professionals the ability to provide fast, accurate and detailed project analysis that simply cannot be duplicated manually. PAYDIRT ® calculates the exact amount of materials needed, eliminating costly truck-off expenses. It analyzes a given situation and directs the project in the most efficient way. Schumack can provide you with quicker and more precise estimates, which saves you substantial dollars. Jim has owned and managed Schumack Engineered Construction since 1979. He originally worked for Schumack from 1964-1968 and then bought the company in 1979. He is in the office on a daily basis to oversee the operations of the company. He holds several licenses to ensure projects are completed in a professional and accurate manner, including: Unlimited Crane License, Contractors and Septic Licenses, Plumbing PM and a Construction Home Improvement License. Jim has 48 years in the industry. Jim's areas of expertise includes all facets of site construction, septic, drainage and grading. He says two of the most interesting projects he has worked on are the Lake Whitney Dam water control project and the Upper Mill Pond Dam rebuild with Centerbrook Architects after the 1983 floods. He lives in Killingworth with his wife and enjoys spending time with his two children and eight grandchildren. Jim is an avid boater, likes tinkering with farm tractors and working his Hereford cattle. 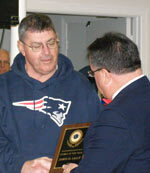 February 18, 2012 - The Killingworth Lions Club has selected James H. Lally as the recipient of its Citizen of the Year award. The award is presented to a citizen of Killingworth who has demonstrated leadership in Community Service. Lally was honored during the annual Lions Club Senior Dinner at St. Lawrence Church last month. In making the announcement last month, the Lions Club noted that "James H. Lally has generously volunteered his time, energy, professional expertise, and corporate resources to improving the town of Killingworth. "I don't know how you managed to stay under the radar all these years with all the things you have done for this community," Lions Club President Hilary Kumnick stated on recognizing Lally. " Susan has been with Schumack since 1997. She is in charge of project procurement, advertising, marketing, estimating, PAYDIRT® takeoffs and contract negotiations. She is Schumack's purchasing agent, assists Jim Lally with daily operations and handles budgeting and annual financial reporting. The most interesting project she worked on was the installation of the Cedar Island water main where divers were used to bury the pipe across the harbor to bring potable water to the Cedar Island residents. Susan grew up on the Connecticut shoreline and currently lives in Old Saybrook. Dan has worked for Schumack for more than 20 years. His expertise lies in earth moving, material processing, sales and logistics, estimating management and excavation. He holds a CT plumbing license, is a P6 Apprentice, has a 10-Hour OSHA certificate, is an OSHA certified site supervisor and competent person and a 40-Hour Hazwoper. Dan currently lives in Lebanon. Scott Hines has worked for Schumack since 1985. He is OSHA Certified with experience in grading, foundations, site concrete, utility installations and supervising & running larger commercial site projects and smaller residential projects. He is a "hands on" superintendent and a master at achieving the goals of both the client and the company. He holds several licenses to ensure projects to be completed accurately. He grew up and lives in Killingworth with his wife and three children. Art has been with Schumack since 1986. He is a certified OSHA competent person with experience in water main and services installation, water main repair, commercial site work and house jacking. He enjoys working on and around the water and the challenge it presents. Art grew up in Killingworth and currently lives in Clinton.